Roger Hector Studios offers the highest quality limited-edition fine art prints. They are museum quality Giclee reproductions on the highest quality heavy watercolor paper. Each is created, and hand-signed and numbered by the Artist, and includes a numbered Certificate of Authenticity to insure future value. A large JPG version of the image(s) will be quickly emailed to you to examine and enjoy! All orders are shipped via FEDEX Ground unless faster delivery is required. 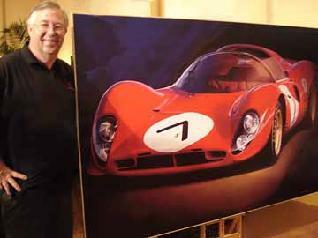 For even larger, hand-made, limited edition signed Giclee prints on canvas, please go to: www.automotiveartgalleries.com These spectacular museum quality images average 44" x 66" and larger, and the quality is breathtaking! There is no better way to decorate your office, den, car collection, or garage, than to immortalize your favorite car in fine art. A high quality portrait painting adds to the provenance of your car and can be exhibited with it, or can extend your enjoyment of your favorite car outside of the garage. A fine portrait becomes an instant family heirloom, and also makes a spectacular gift guaranteed to delight anyone that loves their car! Each painting's cost will be individually quoted, and prices will vary depending on the size and complexity of the desired finished artwork. © Roger Hector Studios. All rights reserved. Reproduction of any image without the specific written permission and signature of Roger Hector is strictly prohibited.